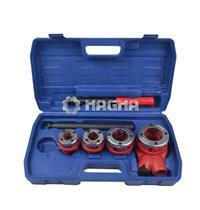 Suitable for threading black gas or Chrome plated pipes. Cast iron dieheads with alloy steel dies, four chasers per head for a clean accuratethread and four waste holes for quick dispersion of swarf. Size: 1/2", 3/4", 1" , 1-1/4".